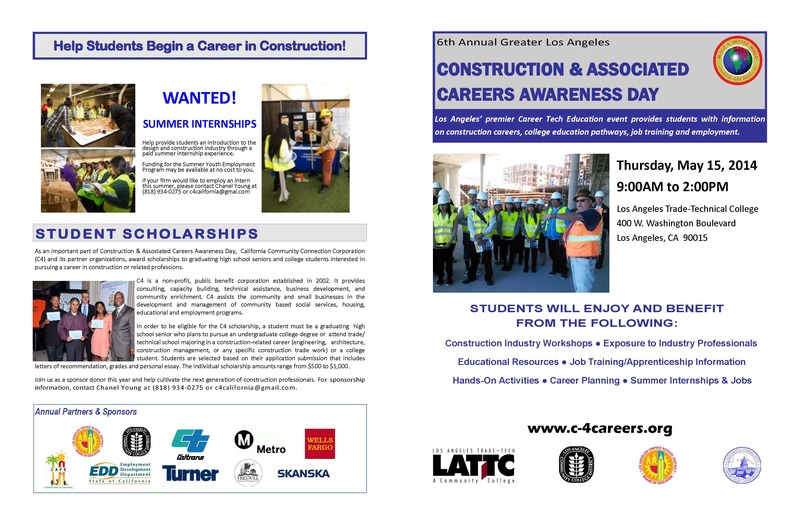 Approximately 3,000 high school and college students are expected to participate on at the Los Angeles Trade Tech Construction & Associated Careers Awareness Day from 9 a.m. to 2 p.m. this Thursday (May 15). Los Angeles Trade Technical College is located at 400 W. Washington Boulevard across the street from the Metro Blue Line Grand Station. Metro is a partner and sponsor of the event to promote careers in the construction industry for those with high school and college students interested in pursuing a career in transportation projects as part of the agency’s Project Labor Agreement and Construction Career Policy. Students will benefit from construction industry workshops, exposure to industry professionals, educational resources, job training/apprenticeship information, hands on activities, career planning and information on summer internships and jobs. Metro currently has three rail projects under construction: the Crenshaw/LAX Line, the second phase of the Expo Line and the Gold Line Foothill Extension. Work on two more rail projects, the Regional Connector and Purple Line, is expected to begin later this year. All are funded in part by Measure R, the half-cent sales tax increase approved by L.A. County voters in 2008. In addition, Metro has begun receiving the first of 550 new state-of-the-art buses and is spending $1.2 billion to overhaul the Metro Blue Line, including the purchase of new light rail vehicles.